This is just a small selection of my work. 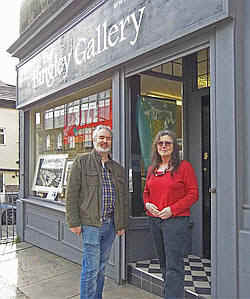 Please visit my real gallery in Park Road, Bingley where it will be on display, or contact me. Limited edition Giclée prints are available from this original - Just 1 left. Limited edition Giclée prints are available from this original - LAST one only. Sorry, Limited edition Giclée prints are sold out. Sorry, Limited edition Giclée prints are not available at the moment. Sheep on the Roofrack – Hewenden from Denholme Cricket Club. Limited edition Giclée prints are available from this original. Sorry, Limited edition Giclée prints are not available at the moment..
Limited edition Giclée prints are available from this original. - LAST one only. Limited edition Giclée prints are available from this original. - JUST 2 left. LSorry, Limited edition Giclée prints are not available at the moment. Limited edition Giclée prints are available from this original. Just 3 left. Hamm is Bradford's twin town. As part of the cultural links between the towns, there was a visit and exhibition of artists from Hamm in Cartwright Hall, Bradford. I was delighted to have been chosen as one of 7 Bradford's artists to visit and show work in Hamm. Welcome to Jane Fielder's website. 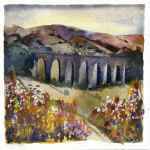 Jane is an artist and former owner of The Bingley Gallery, living and working in Bingley, West Yorkshire, in the UK. 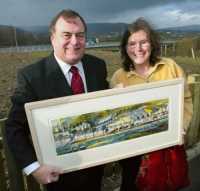 After 12 amazingly happy years, with great difficulty we've managed to retire from the gallery. I didn't want it to just fizzle out and it hasn't. there was a beautiful song written and performed by John Drury, about how one of my paintings had moved him - I will never forget that. You can hear it below. I have received many many kind emails, letters, cards that I will treasure , and the most beautiful flowers. Wonderful visitors and friends came from far and wide to say goodbye, as well as all the loyal local folk who have supported us and faithfully turned up at our previews come rain or shine. And everyone who came and bought things at the mad crazy fun end sale. Thank you so much everybody. Now I would like to thank David Starley for such a lovely happy handover. 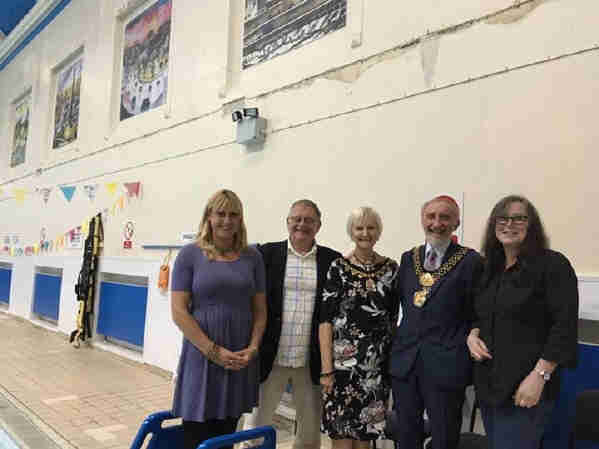 I feel excited and confident that The Bingley Gallery will remain a vibrant, fun, art hub and play an important part in the cultural development of Bingley and of course I am absolutely delighted that he would like Amy and me to continue to be part of the gallery and show our work. The Gallery will now be closed for a month or so while, with Amy and other friends' help, David prepares for the re-launch, which, if all goes to plan should be on Weds 1st May. 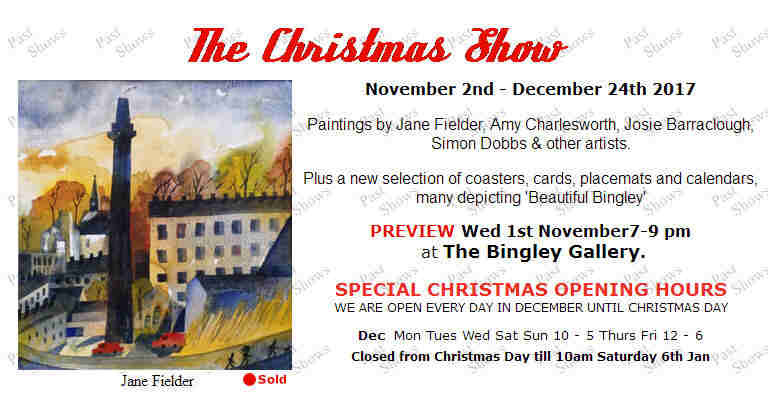 The Bingley Gallery shows an ever changing and evolving collection of art work. We’re delighted that David Starley is taking over the Gallery. It has been a huge part of our lives for the past 12 years and we’ve met the most amazing people, had such fun and I’ve absolutely loved sharing my paintings with you. The fact that David is keeping it as a gallery is a huge relief and makes me very very happy. Especially as he’d like to continue to show some of my work! We wish him every success. 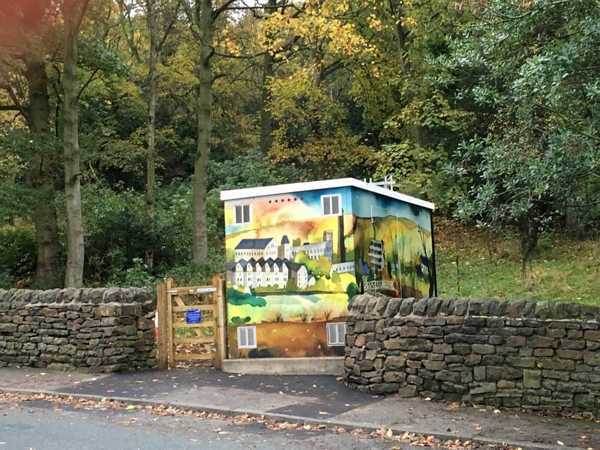 When the gas governor station in Bingley's Prince of Wales Park had to be rebuilt above ground, the Friends of Bingley Park worried about the visual impact on the park they had all too recently adopted and spruced up. and came up with the brilliant idea of decorating it with one of Jane's pictures. You can see a summary of ALL previous shows at the gallery and elsewhere. Go here. Back in early 2015, Jane did an exciting 3-week painting trip to Shanghai. And in that time she managed to produce a body of work for a show, and with huge help from Sue Vickerman and her friends in Shanghai, find a gallery to exhibit and show the work. 'Shanghai Odyssey' - Jane Fielder paints Shanghai from Bel Photographer on Vimeo. I knew Shanghai would be special from people’s reactions when I mentioned my three week adventure back at home in England, in the small Yorkshire mill town where I work as an artist and run my own gallery, but nothing prepared me for the feast that was about to bombard my senses as the plane approached the airport just two weeks ago. My main goal was firstly to GET to Shanghai, then paint and maybe even organise a show there, all within three weeks. I like a challenge. With much help from many people I have done it. There are 16 finished paintings on show, all but three painted in Shanghai. A never ending black worm with legs, snaked its way across the sea, into infinity, as the plane approached Pudong. As we descended, I realised this was some kind of roadway with cars moving along it. It was the first of the sights that I will never forget of my three week odyssey to Shanghai. From that moment on I decided to keep a visual diary of all the treats that I was about to encounter. To jot down notes at the end of each of the 21 days and draw very spontaneous images of the highlights. I started off well, but then the “show” took over! There are just four of the completed ‘diary’ pieces in the show but ….back to the beginning of my adventure. 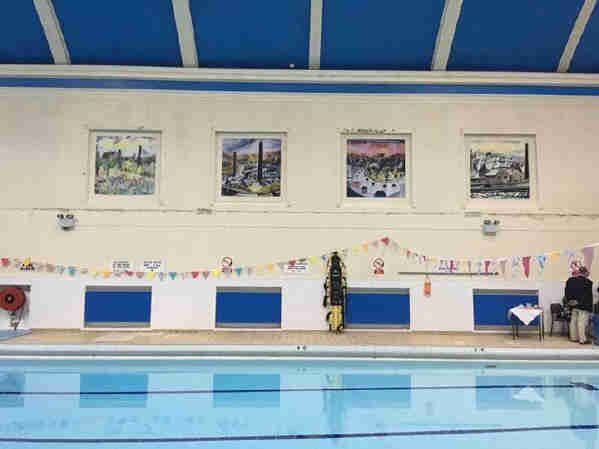 About a year ago, one of my friends, Sue Vickerman, poet, novelist and artist’s model, had burst into the life room in great excitement, declaring she was going to Shanghai for a year, “You’ll have to come Jane. You could paint, you’d love it.” the seed was planted. I dreamt of painting, artist’s exchanges, exhibiting…. I found a flat, booked a flight and here we were approaching Pudong with “worm”, the first of the amazing sights. Each day I went out, improvised portfolio in hand and drew around the city, returning to our flat at night, to convert the meagre sketches to paintings. Space, not making a mess (in our pristine apartment), limited materials and time were restricting factors. Usually I work large and free, to be confined to the smaller pieces of paper, the biggest we could get in our suitcases, was challenging. I soon burst onto some huge pieces of found cardboard and was away. This exhibition is the result of what followed. I will never forget the amazing sights, sounds and smells of this remarkable city, but without a doubt, the memory that will remain with me forever is the kindness, consideration, friendliness, respect and ”can do” attitude of the amazing people we have met in Shanghai. Thank you so much to everyone who has made this experience so special, and to EIGHT ART HOTEL for this wonderful exhibition. 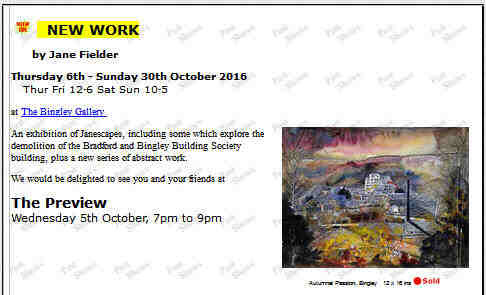 And the Other Galleries and places where Jane currently has work on display or available to purchase! 0113 243 3266 http://www.leedsgallery.com‎ Jane has some of her unframed paintings of life-model Suki on display at this gallery. Suki's website is also well worth following - www.sukithelifemodel.co.uk. and a critic's view of the work. This is a critique by Mike Flay. Mike's collection of short stories Closed Doors is on sale in the gallery at £7.99. and an interesting mention in an article in the "Scotland on Sunday" paper, in an interview with well known poet and novelist Sophie Hannah. Sophie's recent new novel, The Other Half Lives, is set in the world of art, and Jane's work is featured in the plot, and the book is DEDICATED to her! 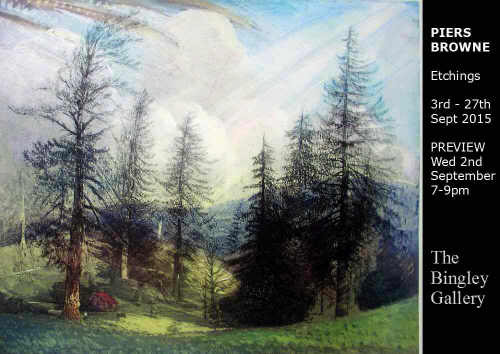 And see this video clip of author Sophie Hannah talking about her work and about one of Jane's paintings. And for an hour of entertainment, watch Jane Fielder painting on the Fourth Plinth in Trafalgar Square. And here are some links to other places on the web where you can see Jane's work. 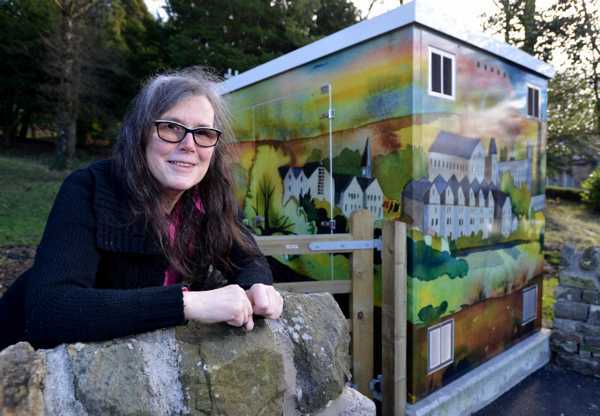 Jane at Aire Valley Arts. Amy Charlesworth, who helps at the Gallery and is a full time artist too. If you are travelling far to see an exhibition, why not ring or email to make quite certain there are no changes. See here for shots of the opening weekend as well as several later shows in the original gallery. Thank you very much to everyone who came and continue to come. 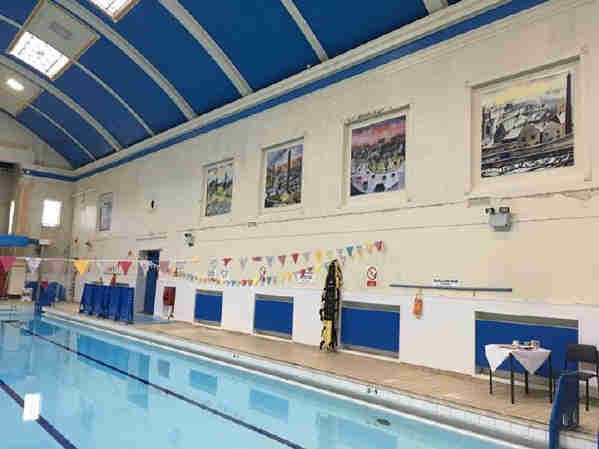 THE NEW BINGLEY GALLERY Opened March 2013. WE have been in new premises since March 2013. Just 3 doors up the road, from 29A Park Road, to 29 Park Road. For those who know Bingley well, this is to what used to be Cranshaws Chemist. We have more room on the ground floor, with 3 separate spaces there. We hope it will give you a better opportunity to browse a full range of work without the stairs in between! PLUS there is a big cellar area where we have an extended choice, with some more whimsical and unusual pieces.